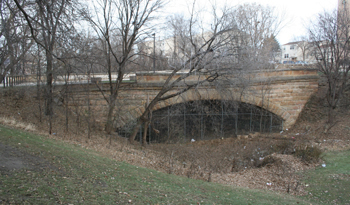 The Colorado Street Bridge is a single-span, skewed masonry arch bridge completed in 1888 to carry traffic along Colorado Street in Saint Paul. The bridge was designed by Andreas W. Munster of the Saint Paul Engineer’s Office. It was closed to vehicular traffic in the 1970s, and currently serves as a pedestrian bridge in the Torre de San Miguel housing development. The Colorado Street Bridge is significant for its arch construction and for its length, which, at over 70 feet, surpasses all other masonry arch bridges in the state of Minnesota. Design and construction of a skewed, single-span, masonry arch. At 70 feet, 6 inches, the arch span surpasses all other masonry arch bridges in the state.